Q: I’ve got a couple of problems with my biceps. Firstly, whenever I do barbell curls I feel more of a burn in my forearms than my biceps. And secondly, I can’t seem to get any peak on my biceps. What’s the key to building an Arnold style bicep peak? A: That’s easy – go back in time to 1947 and get yourself hatched from a sweet little Austrian woman named Auriela. Failing that you could work with your OWN potential. You see, muscle shape is a pre-determined genetic factor in our make-up. And, unfortunately, an Everest type bicep peak doesn’t get dished out that often. Every once in a while you get your Arnold’s, your Robby Robinson’s and your Boyer Coe’s. Meanwhile the rest of us have to work with what we’ve got. Which doesn’t mean that you can’t build some damn impressive arms. It just means that your overall bicep shape is set at conception. Remember though that the only way to realize your potential is to try and surpass it. You need to work the entire biceps for complete development. That means giving equal attention to both the inner and outer heads of the biceps brachaii as well as the often neglected brachialis (the egg shaped muscle on the side of the arm that gives shape and thickness to the muscle group). 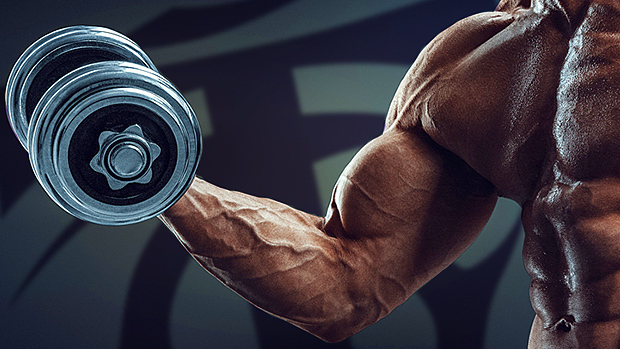 Many trainers compound the problem of genetically limited biceps shape by not performing full range of motion. This can have the effect of leaving a gap between the bicep and the elbow (the dreaded short bicep). Avoid this problem by going through a full range of motion on every rep. Most traditional curling movements tend to favor the inner head of the biceps brachaii, so remember to add in the likes of hammer curls, French curls and dumbbell curls on the preacher bench. To hit the brachialis try cross body hammer curls, bringing the dumbbell across to the opposite shoulder. Continue working hard to develop your upper arms with a variety of curling variations and you will win the arms race – peak or no peak. Now, to your first question. This problem is actually quite common and its solution is, fortunately, quite simple. When you start the curling motion, my bet is that you are curling the wrist in. This puts the tension on the forearms throughout the movement, which is not what you want. What you need to do is to flex your wrist backward during the curling motion. This will take the tension off of the forearm flexors and place it squarely on the bicep – where you want it. It will also make the exercise slightly more difficult to perform, so put your ego aside and lower your poundage’s until you get this one sorted out. You’ll be working your biceps more directly and you won’t have to worry about your forearms being a limiting factor. This entry was posted in Bodybuilding, Training and tagged Barbell Curls, Biceps Training. Bookmark the permalink.